Two bottles of 60-year-old Macallan single malt whisky have been sold at auction in Hong Kong for more than US$1m each, smashing all previous records. Featuring labels designed by artists Sir Peter Blake and Valerio Adami, the two bottles had been expected to fetch roughly HK$4m each at Bonhams’ Rare and Fine Wine and Whisky Sale today (18 May), but went under the hammer for nearly twice that amount. First, a bottle featuring a label design by celebrated pop artist Sir Peter Blake was sold for HK$7,962,500 (US$1m/£752,000) to a telephone bidder. A few hours later, a bidder in the saleroom topped that, buying a bottle with a label by Italian graphic artist Valerio Adami for HK$8,636,250 (US$1.1m/£814,000). These figures include a buyer’s premium of 22.5% of the hammer price. The sale prices surpass the HK$7.72m (US$993,000) paid at Sotheby’s in Hong Kong for a six-bottle lot of Macallan in April 2017. At the time, The Macallan in Lalique Six Pillars Series set a new world record for any lot of whisky sold at auction. The previous world record price for a single bottle of whisky was the US$628,000 paid for The Macallan M Impériale at Sotheby’s in Hong Kong in 2014, although an Impériale holds six litres of whisky, or just over eight-and-a-half 70cl bottles. The two 60-year-old single malts were distilled at Macallan in 1926, matured in ex-Sherry casks and bottled in 1986, with only 12 bottles of each artist’s edition released. These were initially offered as corporate gifts to Macallan’s most valued customers. The Bonhams sale had been touted as a ‘once-in-a-generation opportunity for collectors to acquire the Holy Grail of Macallan’, but a similar pair of bottles was sold at Dubai Airport in April this year for US$600,000 each. According to Dubai Airport retailer Le Clos, the two bottles had originally been sold for £20,000 each, with the last known individual bottle sold at auction by Christie’s in 2007 for US$75,000. The Bonhams sale also set a new record for a single-bottle lot of Japanese whisky, when a bottle of Karuizawa 1960, 52-Year-Old The Dragon – one of only 41 bottles produced – was sold for HK$2.45m (US$312,000/£231,000). Daniel Lam, head of fine wine and whisky, Bonhams Asia, said bidders from around the world had taken part in the auction, with new bidders from Southeast Asia, including Vietnam, Thailand and Malaysia. The 1926 Macallan Valerio Adami was sold at auction by Bonhams in Edinburgh for £848,750. The 60-year-old whisky, with a label by Peter Blake, is expected to fetch up to US$700,000. The bottle of 60-year-old whisky, painted by artist Michael Dillon, will be auctioned next month. A bottle of the ‘world’s most valuable whisky’ is to be auctioned in Edinburgh this autumn. 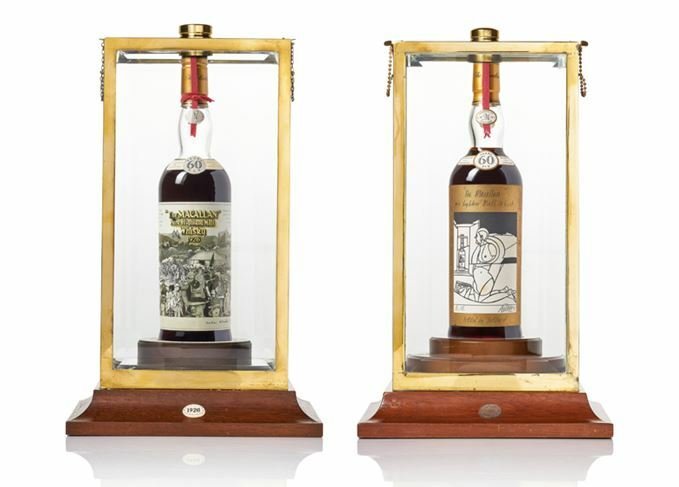 The Peter Blake and Valerio Adami 60-year-old malts will be sold by Bonhams in Hong Kong.